In a srunning victory for the planet's whale population, Japan announced yesterday that it was suspending its annual whale hunt in the waters of Antarctica, blaming Sea Shepherd, the marine conservation group whose anti-whaling tactics spawned its own television series, Whale Wars. 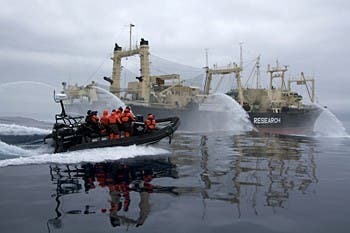 According to most reports, the hunt this year was a failure because of the relentless harassment of Sea Shepherd and its trio of anti-whaling vessels, including Gojira (which is the Japanese name for Godzilla). According to news reports, the whaling fleet has left its hunting grounds and is heading back to Japan. This is an amazing victory that may prove to be the death knell to the factory ships which have trawled the oceans of the southern hemisphere for decades, ships which, despite international bans, have illegally harvested critically endangered blue whales and beloved humpbacks in addition to the minke, fin, and other whale species under the guise of "scientific reserach."